256 pages | 22 B/W Illus. the key issues and challenges that contemporary journalists face. Case studies, exercises, and an interactive companion website encourage critical thinking about journalism and its role in society, making students more mindful practitioners of journalism and more informed media consumers. 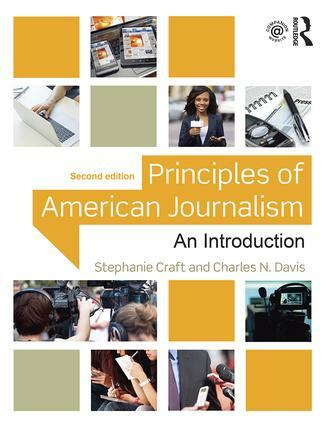 "Craft and Davis adeptly articulate the importance of journalism in society through its history, impact, successes and challenges, particularly in the significant changes revolutionizing the field today. No other book boils this down as succinctly and clearly. Their book should be required reading for anyone considering a career in journalism. Stephanie Craft is Associate Professor of Journalism at the University of Illinois at Urbana-Champaign. Before earning a doctorate in Communication from Stanford University, she worked as a newspaper journalist in California, Arkansas, and Washington. Charles N. Davis is the dean of Grady College at the University of Georgia, and is the former executive director for the National Freedom of Information Coalition (NFOIC), headquartered at the Missouri School of Journalism. In 2008, Davis was named the Scripps Howard Foundation National Journalism Teacher of the Year.